We recall that on the 14th of October 2016, agents of Buhari known as the Department of State Services (DSS) trailed Nnamdi Kanu to his hotel in Lagos as he was on transit to Biafraland and arrested him. After several physical abuse and torture, he was flown to Abuja for further torture and physical abuse. Desperate to jail Nnamdi Kanu, the DSS raised several trumped-up charges which were summarily dismissed by the courts. Both Magistrate and High courts issued orders for the unconditional release of Nnamdi Kanu but Buhari’s DSS refused to obey the court orders. On the 30th of December 2015, Buhari boasted to the global viewing audience that Nnamdi Kanu will never be released. In the meantime, as Biafrans in Biafraland gathered to pray for the success of their leader, Nnamdi Kanu, in the legal battle against the DSS, Buhari ordered his military and other security agencies to open fire at them, which resulted in the death of scores of Biafrans. Recently, on the 30th of May 2016, Buhari in conjunction with the governor of Anambra state—Willie Obiano, deployed the Nigerian Army from Onitsha military barracks who shot and killed over 200 unarmed peaceful Biafrans that gathered to commemorate the day Biafra was formally declared (49 years ago) as well as remember the fallen heroes of the war of genocide levied on Biafra by Nigeria and Britain. Between the illegal detention of Nnamdi Kanu and the massacre of Biafrans on the 30th of May 2016, Buhari has steadily and continually engaged in ethnic cleansing of the Biafran people. His killing spree on Biafrans and the despoliation of the Biafran environment plus the refusal to obey court orders on the release of Nnamdi Kanu were harbingers to the emergence of diverse freedom-fighting groups which Buhari and his acolytes nicknamed militants. One of these freedom-fighting groups is the Niger Delta Avengers (NDA). The NDA has dealt a devastating blow in the oil and gas industry and for which hydrocarbon production has plummeted. The political environment in Nigeria has remained unstable. Nigeria has developed irreparable fault lines engendered by Buhari’s inept partisan governance style and his non-observance of the ethos of democracy and the rule of law. Both Executive and Legislative arms of government are confused, unproductive, and antithetical to democratic objectives. Instead of Buhari to carry out reflexive praxis on the many issues bedeviling the country he claims to be the president of, he is busy beating war drums and enjoying his pastime which is the slaughter of innocent Biafrans. Unknown to Buhari, the root cause of the aforementioned political woes facing his country is the illegal incarceration of Nnamdi Kanu and the flagrant disobedience of court orders related to the unconditional release of Mr. Kanu. As a matter of fact, the call for restructuring wouldn’t have happened if not for Nnamdi Kanu’s well-articulated and relentless pursuit of Biafra and Buhari’s dictatorial nature of interfering with the judiciary. Meanwhile, the social spectrum is also badly hit by Buhari’s lack of basic understanding of how democracy works and the need to subject himself to the law of the land which he swore to uphold and obey under Schedule-7 of Nigeria’s Constitution. Several thousands of lives have been avoidable lost to terrorist attacks coming from Islamic fundamentalists of Northern extraction under the protection of Buhari. From Borno to Benue and from Potiskum to Port-Harcourt, several lives have been cut short courtesy of a dysfunctional security and law enforcement system. People are now walking and looking over their shoulders and around them while thanking their creator for sparing every minute of their lives. This was not the situation prior to the illegal incarceration of Nnamdi Kanu. The jet speed with which the economy of Nigeria descended into the abyss since the illegal incarceration of Nnamdi Kanu has been unprecedented. Readers should take time to review the economy of Nigeria before and after the illegal arrest of Nnamdi Kanu. Today, the only income-generating resource (Crude oil) for Nigeria is at all-time low. Even the Managers of Nigeria’s finances have openly confessed that Nigeria will not be able to execute 50% of planned projects because of the activities of militants who are all in unison in their demand for the unconditional release of Nnamdi Kanu. As a matter of fact, the investors in oil and gas in Nigeria should blame Buhari for the activities of NDA and other militants because if Buhari had released Nnamdi Kanu there would not have been the destruction of oil and gas pipeline and facilities nor would there be any momentum or impetus for other separatist groups to emerge. If the present trend continues Nnamdi Kanu would have succeed in destroying Nigerian economy as militants will not stop blowing up pipelines until one of their key demands are met which is his release. In particular, the militants’ demand for the unconditional release Nnamdi Kanu is 7th item on their list of demands and the question bothering everybody’s mind is why Buhari and his government have chosen to downplay demand #7 when that is the only opening available to them to make meaningful human contact with the militants. Religious bigotry has reached a crescendo in Nigeria under the presidency of Buhari especially since the illegal incarceration of Nnamdi Kanu. There have been beheadings of Christians by Islamic fundamentalists, lynching of non-Muslims by Boko Haram members, and outright mass-murder of Shiite Muslims by Sunni-practicing members of Buhari’s armed forces. Buhari deployed Boko Haram members to Biafraland to rampage and massacre Christians especially members of Indigenous People of Biafra under the leadership of Nnamdi Kanu. Buhari did this with the sole aim of stifling the quest for the restoration of the nation of Biafra. The Judiciary has been completely compromised and put under the direct dictation of Buhari from the time Nnamdi Kanu was illegally arrested. Most Judges now pander to the whims and caprices of Buhari for fear of being dismissed from service or killed in a mysterious manner. The shenanigans going on in the court room of Justice John Tsoho speak for itself. The independence of the Judiciary is now an unknown phenomenon in Buhari’s Nigeria. Nigeria is truly in a very big mess from the time the DSS illegally arrested and unconstitutionally detained Nnamdi Kanu. 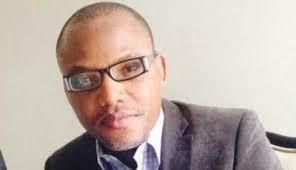 The reputation of Nigeria and that of Nigeria’s assumed president (Buhari) is in tatters and got worse from the time Buhari illegally arrested and detained Nnamdi Kanu. There is a bleak future for Nigeria as long as Buhari continues to keep Nnamdi Kanu in captivity. Nigeria is already on a cliff-hanger and just a tiny strand is what remained for it to descend into irredeemable catastrophe. Like Somalia under Siad Barre, Nigeria under Buhari is sliding into the abyss because of the stubbornness or some would say suicidal tendencies of one man. As Somalia collapsed into a failed state and terrorist heaven today, so will Nigeria follow suit because of the antics of Buhari. Nnamdi Kanu’s illegal detention and Buhari’s disobedience of court orders have negative implications for the stability of West African region as well as crude oil price stability globally. It has been confirmed form reliable sources in Nigeria’s Presidential Villa that 60 percent of calls to Aso Rock from overseas is about Nnamdi Kanu, IPOB, Niger Delta Avengers, and the collapsing economy. The European Union, the United Kingdom, and the United States of America must take notice that there will surely be another war in Nigeria with far more deadly consequences worse than that of Somalia and Sudan combined. The only way this prediction can be avoided is to ensure that Buhari obeys court orders by releasing Nnamdi Kanu unconditionally. Anything short of unconditional release of Nnamdi Kanu in accordance with the court orders will make Nigeria current political instability snowball into anarchy and at the very end, Nigeria as we know it now will never be the same again. The ball is in the court of the international community to make the right decision of requesting Buhari to release Nnamdi Kanu unconditionally and the time to make that decision is now.